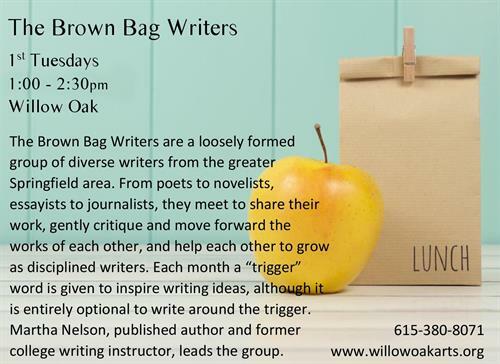 Event Description The Brown Bag Writers are a loosely formed group of diverse writers from the greater Springfield area. From poets to novelists, essayists to journalists, they meet to share their work, gently critique and move forward the works of each other, and help each other to grow as disciplined writers. Each month a "trigger" word is given to inspire writing ideas, although it is entirely optional to write around the trigger. Martha Nelson, published author and former college writing instructor, leads the group.